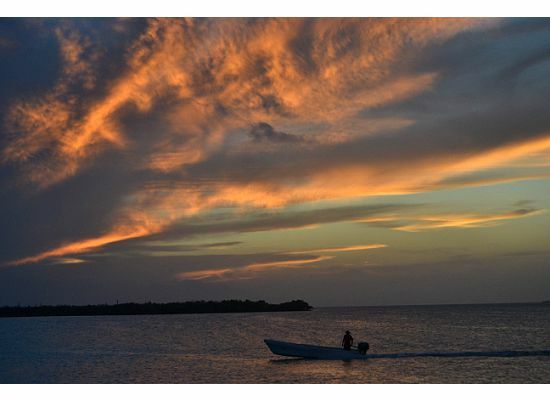 We were staying on Caye Caulker, a tiny island just south of the larger, more famous and resort-crammed Ambergris Caye. It couldn’t have been further from the wintry streets of New York, from where we had come. Palm trees and brightly coloured houses fringed the unpaved streets. Golf carts—one needs a permit to own a car on Caye Caulker and they are rare—bicyclists and stray dogs were the undisputed kings of the roads. Locals and tourists alike strutted around sans shirts and shoes. And then there was the sea. Streaks of turquoise blended in broad brushstrokes with patches of agate green; a spatter of white topped the swells. The next morning we set off for a half-day snorkelling expedition. The first site was somewhat intimidatingly called Shark and Ray Alley. After a few basic tips from our guide (“Don’t pet the sharks, but you can touch the backs of the stingrays”) we got into the water. It was warm and welcoming; the sun’s rays easily pierced the shallow water. The water was slightly sandy, but the murkiness didn’t take away from the excitement of swimming with nurse sharks and half a dozen stingrays. The sharks weren’t dangerous, we had been assured, but I was still startled every time one swam by, barely missing my paddling feet in a feat of last-second navigation. Though they can grow up to 14ft, the sharks we saw were 2-4ft long. 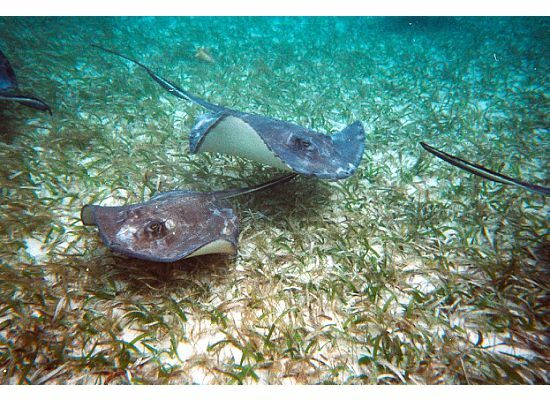 Below them the grey-blue Caribbean stingrays swooped, and despite stretching a tentative finger a time or two, I could never manage to stroke their backs as they dipped and dove under me. I stayed as long as I could, fascinated by their grace. Shark and Ray Alley was the highlight of the day, and by the time our boat returned to shore, we were happy to hit the showers and then head out for some local seafood. The next day, we would begin our scuba certification course. Our first scuba experience was in a mere 10ft of water, where I learnt that human beings cannot naturally breathe underwater—and that I was no exception. The simplest of our tasks defeated me. While diving, the snorkel mask can easily come off your face, and all divers must learn to remove it, breathe normally through their mouths using the regulator (mouthpiece), and replace it. My two companions mastered this skill in a matter of minutes. The first time I tried, the removal of the mask—which encapsulates your nose in an airtight triangle—confused my senses, and I inhaled a noseful of seawater. Panicking and sputtering, I kicked my way to the surface. Sheepish, I vowed to do better the second time—with the same result. My instructor, a sunny Canadian import called Hillary Pike, was patient and supportive. I mentally nicknamed her the Diver Whisperer. Whenever I panicked, thrashed about, or came close to hyperventilating, she would calm my fears. The third time, by pinching my nostrils with one hand, I was able to dissuade myself from trying to breathe through my nose underwater. Victory! Over the course of that day and the next, we did three more dives, the final two in 60ft of water. We learnt new skills each time, and practised some of the old ones. To my chagrin, I had to practise the mask removal thrice before Pike was convinced I could do it. I wasn’t a natural at scuba. But each successive dive was so beautiful that I couldn’t help but swallow my fears and get back into the water. Unlike snorkelling, where you’re on the surface, a foreign visitor to an exciting world, with scuba-diving, you can, for a short time at least, be part of the action. You can follow fish down to the coral, and squint into their hidey-holes and see if they show any signs of coming out. You can swim all the way to the bottom and pick up small shells from the sand. You can follow a shy eel as it tries to keep its distance. We did all that—and more. Pike pointed out the landmarks of our underwater world. 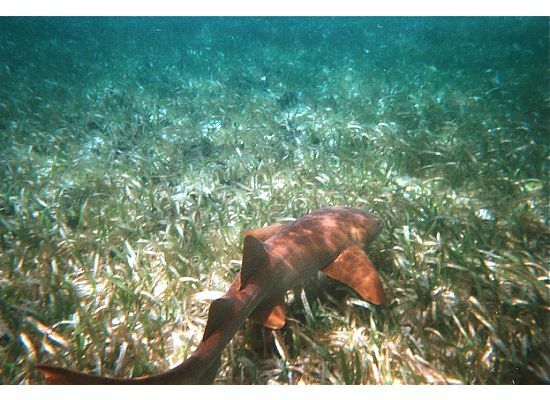 Like a safari tracker, she found a lone nurse shark and beckoned us to follow it till it disappeared. She pointed out a spiny lobster that was half-hidden in a crevice of coral, coaxing it to emerge. We saw nearly circular blue tang and yellow tang, the small, striped bluehead wrasse, the aptly named rainbow parrotfish, more Caribbean stingrays, and a cleverly camouflaged spotted eagle ray, many, many shoals of yellowtail snapper, a thin grouper that was almost submerged beneath a layer of sand, a trumpetfish that looked as long and as silver as a needle, and several shimmering great barracudas, floating peacefully on the surface as though they were just there to catch a few rays. And those were only the ones whose names I remembered. Even in spots where fish were scarce, the beauty of the coral was enough to make the dive worthwhile. There was incredible diversity. The colours ran from nightclub electric purple to dainty pastels. There was a hard brain coral, softly waving, leaf-like coral, spiny ones that looked like stag antlers, and more. Finally, there was the magic of stepping out of your world and into another—a bit like the experience of travel itself, but more intense, more new in every way. Thanks to complicated equipment, human beings can breathe (through their mouths!) underwater. The weight of all that water pressing down on you brings it home in a way that can induce panic, if you let it, or encourage wonderment. You play with your breathing, and allow time to slow down, and with it the big-city pace of your thoughts, to wait out that brown-and-white lobster that you’re determined to see in all its spiny glory, just once, to flap your flippers lazily and enjoy every second of this enchanting underwater adventure. This article was published on 29 April 2011 in the Indian newspaper Mint. See also the accompanying sidebar, Dive Right In, about how to get PADI certification for scuba diving and where to put those scuba lessons to good use.